The tornado sirens went off again last night in Joplin and some nearby towns as storms swept into the area from the west. This time, however, the worst winds to hit Joplin were clocked at 70 mph. Seven tornado warning sirens remain standing in the Joplin tornado zone. The state emergency management agency has tested them–and used them last night. Some that were blown away Sunday evening were replaced yesterday and more will be replaced today. 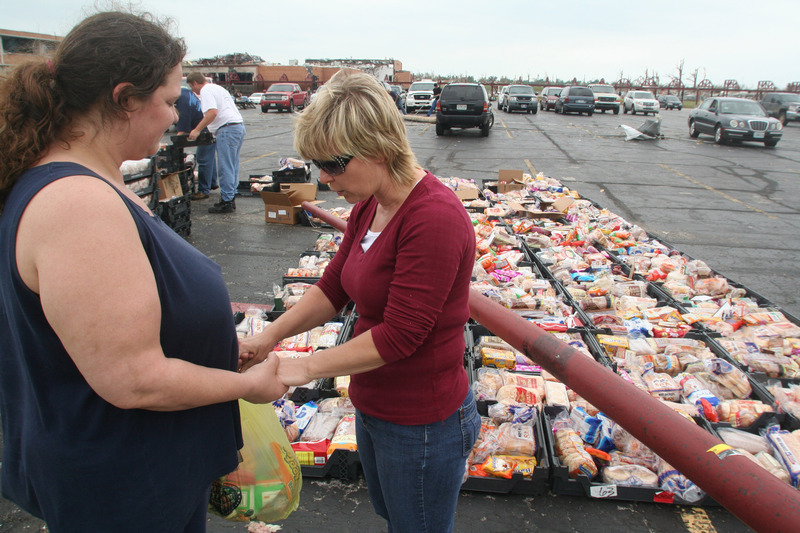 The state emergency management agency has increased the number of dead in Joplin is to 123. SEMA says 750 people have been treated at Joplin’s two hospitals and another 100 people have been taken to hospitals outside the area. Five-thousand buildings have been damaged. Another estimate says two-thousand of those buildings have been destroyed. Damage is estimated at two-to-three billion dollars. National Weather Service survey teams have put together a clearer picture of what happened Sunday night in southwest Missouri. Teams have confirmed the tornado that hit Joplin was the worst kind–an EF-5 with winds of more than 200 miles an hour. But there were other tornadoes Sunday evening. The Weather service says an EF-2 tornado touched down northeast of Diamond and stayed ont he ground for 17 miles with a half-mile wide track before it lifted north of Monett. Four mobile homes were damaged. Another EF-2 tornado touched down in central Stone County near Galena and tracked for 16 miles toward Saddle Brooke in Taney County before lifting about a mile from that town. The weather service says that one had a 200-yard wide path that destroyed several turkey barns, damaged a house and several outbuildings. Heavy rains also caused flooding in Seneca, in Newton County, that affected 40 homes and several businesses. More than two dozen people had to be rescued. Joplin police are restricting access to the areas of Joplin devastated by the tornado and the city has put a 9 p-m to 6 a-m curfew on the area.. People will need permits to get into the area and they’ll have to prove they have a specific reason for being in the zone. Governor Nixon has signed an executive order allowing doctors from other states to treat people in Joplin and for pharmacists to provide critical medicines to people whose records are missing. Ten Joplin schools have been damaged and four of them have been destroyed in the tornado. But school officials say classes will start as usual on August 17th. They put damage to the schools at 100-million dollars.